Arizona is a state that is rich in natural scenery – much of the state is very sparsely populated, and there are a ton of beautiful day trips that people can take. Also, we have some of the best roads in the country, with little snowfall to harm them every year. Here’s a look at the best Arizona Road Trips for you and your family. Fossil Creek is a permanent stream not far from the community of Strawberry. It’s about a 2.5-hour drive from Phoenix. It is a tributary of the Verde River, and flows from the Mogollon Rim until it joins a much bigger stream at the old Child Power Plant. Fossil Creek is a lovely place to visit, with delightful natural scenery, trees, pools and more. You will like nothing better than to go for a quick swim here, and have a family picnic under the shades later. Remember: You’ll need a permit to visit this place as the local authorities are worried about the creek getting overcrowded. Fossil Creek is important to Arizona as it is one of the two waterways in the state designated as a National Wild and Scenic river. Remember those old mining towns in the West? Bisbee was once one of the most important mining towns in America, where thousands of workers mined for gold, copper and silver. They used to call Bisbee, “Queen of the Copper Camps.” More than 8 billion pounds of copper and 3 million ounces of gold were extracted from this place over the years. Bisbee is located right in the middle of the Mule Mountains in Southern Arizona. It has a population of 5,000. Tourism, not mining, is the biggest industry there, these days. Bisbee was declared as the Best Historic Small Town in a 2016 online poll by USA Today and Sunset magazine. Certainly worth a visit! Jerome is a tiny “ghost town” which was once home to more than 15,000 people. It was founded in the nineteenth century. It was built right on top of the Cleopatra Hill, at an altitude of 5,000 feet above sea level and offers a scenic view of the Verde Valley. Jerome was a major copper mining town in the early 20th century. It was a wild, wild place back then with gambling, alcohol, drugs and almost daily gun fights. But the town lost its importance once the copper deposits were depleted. It is today considered a ghost town, with the population dropping to just 444 people, most of who are involved in the tourism business. You can still see the historic landmarks, trendy bars and restaurants, many of which have been revived recently. Things to do and see in Jerome: Visit Gold King Mine and Ghost Town, Jerome Historical Society Mine Museum, the old Bartlett Hotel, go shopping at the town’s Historic District and wine tasting at Bitter Creek. Sedona, also known as Red Rock Country, is one of the best road trip destinations in Northern Arizona. It has some of the most spectacular natural sceneries and best hiking trails you’ll get anywhere. Sedona is almost always packed with tourists, fitness enthusiasts, photographers, families, nature enthusiasts and people who just want a quiet place to meditate. You can go on jeep tours, gorgeous hikes, get a massage or a psychic reading, or visit Slide Rock State Park (a natural “water park”). There is so much to do in Sedona! 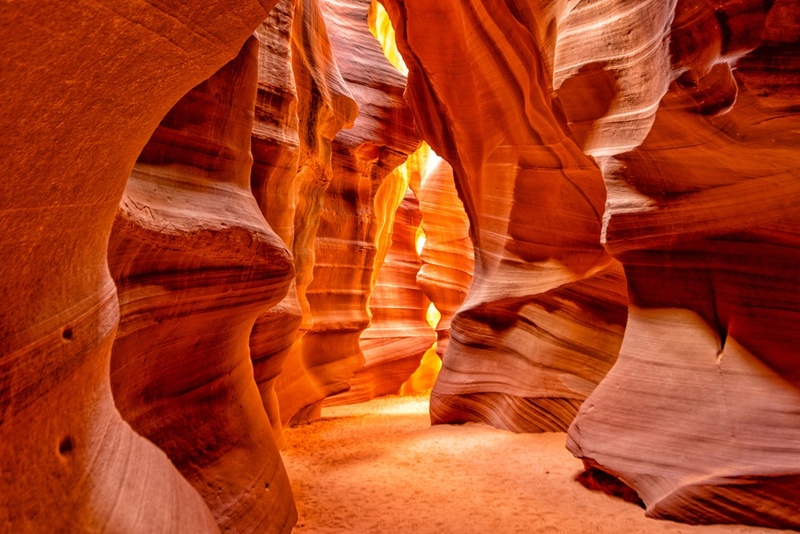 Antelope Canyon is popular tourist destination packed with travelers and photographers and is a critical source of business for the members of the Navajo Nation. These canyons are under the jurisdiction of the Navajo Parks and Recreation, which means that a permit is required, and this must be schedule in advance! Not far from Antelope Canyon is Horseshoe Bend, an incised meander of the Colorado River, with the shape of a horseshoe. This is a perfect spot to catch the sunrise because of the unique topography – it is also free to visit and just a short hike off the highway.